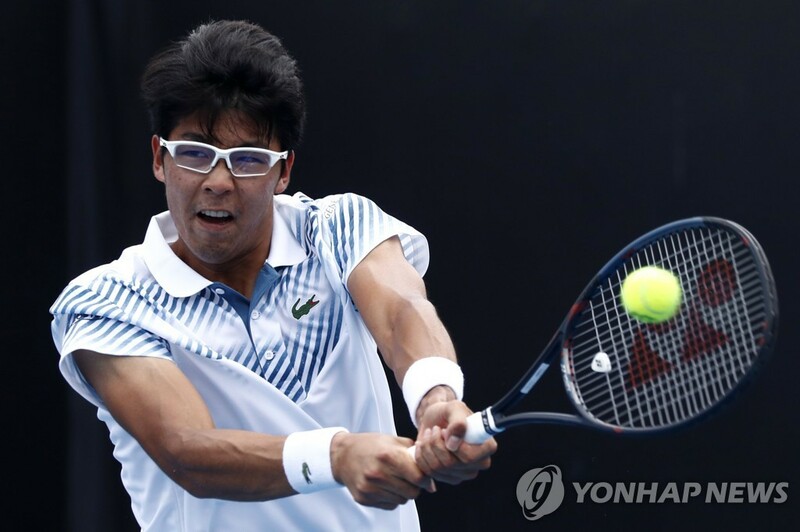 South Korean Chung Hyeon rallied for a nail-biting first round victory at the Australian Open on Tuesday. Chung, seeded 24th, edged out the unseeded American Bradley Klahn 3-2 (6-7 (5-7), 6-7 (5-7), 6-3, 6-2, 6-4) at Melbourne Park. In the next round, Chung, world No. 25, will face the 55th-ranked Pierre-Hugues Herbert, who knocked off Sam Querrey in the first round. Chung and Herbert have split their two previous meetings, with Chung prevailing in the qualifying round for the 2015 Australian Open and the Frenchman coming out on top in the first round of Wimbledon later the same year. Chung, the highest-ranked South Korean player at No. 25, made a stunning run to the semifinals at last year’s Australian Open. And Chung’s dreams of repeating the feat were almost dashed in his first match, as he dropped the opening two sets against Klahn in tiebreaks. Klahn came into the match never having won an Australian Open match but gave Chung all he could handle early on. The two failed to break each other in those first two sets. In the first set tiebreak, Chung went ahead 3-1, but Klahn pulled even with an ace and a forehand error by Chung. Klahn then reeled off three straight points for a 6-3 lead. Chung battled back for two more points on Klahn’s unforced errors, but Chung committed his own error with a backhand to hand the set to Klahn. In the second set tiebreak, it was Klahn who opened up a 3-1 lead. Chung made it a 3-3 tie and the two traded points until Klahn led 6-5. Chung’s double fault awarded the game to Klahn, who now led the match 2-0. Chung came out firing in the third set, breaking Klahn for the first time in the opening game en route to building a 4-1 lead. He took the set 6-3 — the first set he’s won in three tournaments this season. The pendulum swung further in Chung’s favor in the fourth set, during which Klahn called a medical timeout to receive treatment on his back. Chung was in full control of a 6-2 set victory. In the deciding set, Chung was leading 3-2 when he wasted a triple break point. He held a 5-4 lead and finally broke Klahn, winning the last two points on the American’s unforced errors. Klahn had 22 aces to Chung’s 10, and he had 58 winners, 24 more than Chung. But the South Korean played a steadier game with 35 unforced errors, compared with 84 by Klahn.